Background: Epidermal growth factor receptor (EGFR) is a well-recognised drug target exploited for treating non-small cell lung cancer (NSCLC). Gefitinib and erlotinib are first generation clinically employed inhibitors used against EGFR activating mutants. However, during course of treatment these inhibitors become ineffective due to the emergence of an acquired secondary mutation. Subsequently, in order to overcome non-responsiveness second and third generation inhibitors were designed having covalent bond and irreversible mode of action. However, these inhibitors were shown to be toxic. This led to the discovery of lead candidates with completely different mode of action and therapeutic efficacy. Objective: We have reviewed the recent efforts undertaken by researchers in discovering newer noncovalent reversible next generation inhibitors for treating NSCLC. Methods: We first studied the optimization steps and pharmacokinetic variables of the synthesised molecules. We also analysed bonds and interactions using PDB X-ray crystal structures as well as scaffold and selectivity analysis was undertaken. Results: We identified that ligand lipophilic efficiency driven potency is a preferable optimisation parameter for maintaining drug likeliness of the molecule. Also, few h-bonds were recognised as major players in affecting the binding of compound. The scaffold analysis revealed that ligand molecules with pyrimidine core exhibit higher inhibitory activity against TMLR, as well as higher selectivity with respect to other kinases. 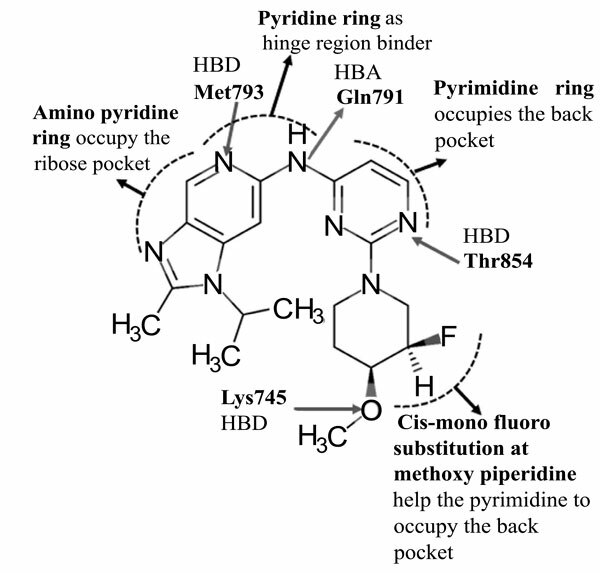 Conclusion: Next generation reversible inhibitors exhibited unique binding mode and were found to occupy three major pockets (ribose pocket, back pocket and hinge region), which is critical for increasing the selectivity of the compound against TMLR mutants. EGFR, reversible inhibitors, covalent inhibitors, activating mutation, secondary mutant, TMLR inhibitors.